Today was an absolutely gorgeous day in Paris – it felt like spring had finally arrived. I decided it was warm enough for the little Vogue jacket I made last September. Do you remember it? I had even asked for your opinion about it. To my shame, I realized while taking it out of the closet that I had never shown it to you, because I went to a conference in Italy (with it) hours after I finished it, and the new academic year started a couple of days later… then it got too cold to wear it, I put it away for the following spring, and forgot you’d never seen it. Here it is finally, courtesy of my faithful tripod and the beautiful evening sunlight. I really like this jacket… it feels a bit Audrey to me. You all know how much I love Audrey Hepburn, right? I hope won’t seem totally ridiculous to associate her name with this über-simple jacket. 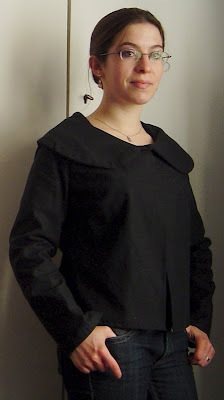 I made lots of alterations to the initial pattern because the jacket looked like a tent at first. I can’t remember all the alterations I made, but I do remember that I added a back pleat and changed the look of the front by sewing a single snap at the neck and ditching the buttons. I wanted the focus of attention to be the wide Peter Pan collar, so I made the front as smooth and simple as possible by using a single closure, and one that would be hidden. I just love the wide Peter Pan collar, and the graceful way in which the neckline shows off the neck – just a little lower than a regular jacket, though not too much. This looks very chic over my Indémodable dress, but I think it looks pretty neat with jeans, too. Nice to see a post from you when I browse the internet for the last time before my holidays. Lovely jacket, I like it with the jeans. Hope you find time to sew again soon.Best wishes. What a gorgeous jacket, Isabelle, and so very “you”!! Wishing you a wonderful weekend, too! You look adorable in that jacket! I completely see why you associate Audrey with that jacket. Her style was simple, classic and clean – just like that cute jacket! Very nice Isabelle! Glad to see you are doing well! That jacket is so chic Isabelle! I used to own a gorgeous 50s black jacket with a Peter Pan collar very similar to that one. I don’t have it any longer (black isn’t really my colour) but yours reminded me of it 🙂I hope you have a wonderful weekend! It is beautiful. You sew so beautifully my friend. Isabelle – The jacket is very “Audrey” and so gorgeous. What a treat. I love that you can dress it down with jeans too. Enjoy your weekend. 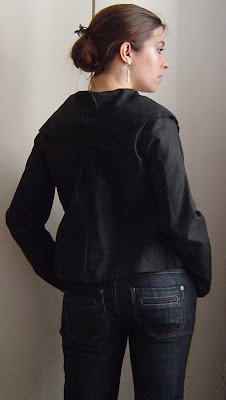 Definitely this is an “Audrey” jacket – chic and simple. Glad to hear that it is spring in Paris and you can wear this. Beautiful jacket. Your sewing and designing skills always amaze me. I have all these ideas in my head and they only stay there and I can never ‘translate’ them into a real garment for myself. My dolls are pretty lucky though, as I stitch for them very often and they have a better wardrobe then me!How is P’tite Mignonne since her surgery? If you have time you can read on my blog about the trouble I am having with our oldest cat, Alix. Luckily all seems a bit better now, but her old age is something that can not be cured. To come to your blog and see your gorgeous creations lifts my spirits so much. My dearest friend, you did an outstanding job on this jacket!!!! Just beautiful and elegant, and so “you”! I’m glad you’ve been able to sew (I don’t know what my life would be if I didn’t sew, because I’m going through some really rough moments in life and sewing is what keeps me standing right now, my true pleasure and escape from all the problems).Many many hugs from a *sometimes* warm Portugal! What a beautiful, stylish jacket, ma belle, and you look so beautiful in it! I’m happy to have you back in the virtual sewing world! Gros gros bisous.